U.S. states that have a monopoly over their liquor sales seem to charge slightly more for booze than so-called license states without such control, according to a new price comparison. 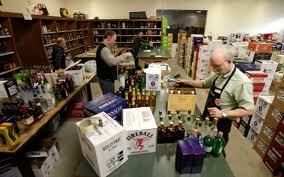 “We found that the average price of liquor is lower in license states. It was on average $2 lower per product, which is about a 7 percent difference,” said lead author Dr. Michael Siegel, a researcher from the Boston University School of Public Health. As of February 2012, 18 control states in the U.S. set the price of liquor sold to their retail stores, and 13 of those also set the price for the general public. The other states sell liquor licenses to private business owners, who set their own prices. Generally, in states and areas that have considered putting control of liquor prices in the hands of private businesses, the public has supported privatization. But, the researchers note that while control states tend to charge slightly more for liquor, they also make a lot more money from their liquor sales.